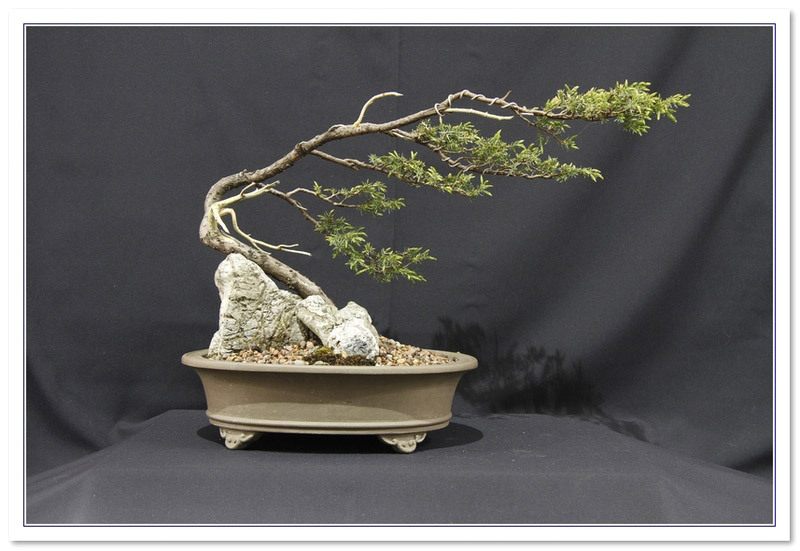 Challenging the Bonsai A to Z entry for Juniper - Needle (Juniperus rigida/communis). Evergreen tree originating from mountains of Japan is distinguished by its needle like leaves which grow in groups of three on slender shoots. The bark is brown and flakes away to show orange/red underbark. Often in bonsai this is combined with silver grey driftwood sections. The female tree will bear green berries if grown alongside a male and these turn to purple/black over the next two years. WARNING : Pruning can cause overcrowded foliage mass which harbours pests. To prevent this, prune outer end so fthe foliage twigs once per year, leaving younger shoots growing from further back. REPOT : Every 2-5 years in spring. After 10 years inspect roots annually but expect to repot every 5 years approximatly. PRUNE : May be pruned any time but late summer is best when sap is not rising fast and likely to cause bleeding. WATER : Water well in growing season, keep moist in winter. Junipers are surprisingly thirsty in winter. FEED : Balanced feed in growing season, nitrogen free in autumn and a single applicaion of slow-release balanced feed in mid-winter. There are 819 entries in the A to Z and the pages have been viewed 3061131 times. Help us to increase the number of relevant bonsai terms included in this A to Z of Bonsai Terms. We include manufacturers and dealers in the dictionary, if you are one or know of one not mentioned then just click the link above and add an entry. If you have a favourite bonsai tree not mentioned just add an entry. We are trying to create a unique single free source for all bonsai terms and hope to capture worldwide bonsai terms for bonsai trees, bonsai clubs associations and national collections and the A to Z is free marketing for bonsai businesses and bonsai clubs.